M. G. Polyblends offers a wide range of colour and additive masterbatches to match different processing techniques including extrusion, injection moulding, blow moulding, thermoforming and rotomoulding. The company truly reflects the spirit of entrepreneurship. Established by young, qualified engineers, who have more than a decade's experience in the plastic compounding industry, M. G. has entered the challenging field of masterbatch development. In this way, M. G. masterbatches are contributing to a diverse spectrum of plastic end-products: ranging from plastic bottles to car covers, multilayer & greenhouse films to pipes, yoghurt cups to tarpaulins. But the company's most significant strength is its ability to play the role of a perfect partner to its valued clients. Working closely with the customer through the entire development process, M. G. delivers a masterbatch that meets his requirements precisely. More importantly, M. G. prides itself on making available masterbatches of excellent quality with consistent repeatability and timely deliveries. The focus clearly is on nurturing a long term, mutually rewarding association with a fully satisfied customer. 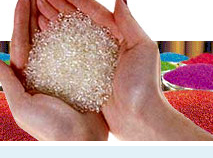 M. G. Polyblends White masterbatches are based on international quality Titanium dioxide which were selected based on their excellent optical properties such as opacifying/tinting strength, undertone, and color. This Titanium dioxide has a unique surface treatment which gives good dispersion in plastics and also has no effect on rheological properties of the polymer. If the Titanium dioxide does not properly disperse in plastics then it will lead to unefficient use of pigment and a loss of optical and mechanical properties. M. G. Polyblends White master batches are unique in their way in that they contain speciality additives which makes the resin compatible with titanium pigment and also mkaes the resin to flow so that it gets dispersed properly. M. G. Polyblends has a lot number of varieties available in White masterbatches depending on the percentage of Titanium dioxide, tone required such as egg tone, bluish tone, violet tone etc. and also on the end use application and processing techniques. We are giving below few of our white masterbatch range available. White masterbatch gives whiteness, brightness and opacity in the final product. To provide these properties in platics, many chemicals such as Zinc Oxide, Zinc sulphide, Antimony oxide, Titanium dioxide are used. Titanium dioxide is mostly used in plastic application because of its unique properties such as high refractive index, average particle size (0.19-0.22 micron) etc. M.G. Polyblends has developed various grades of Black masterbatches based on end use requirements eg: Jetness required, Protection from UV radiation, conductivity etc. Carbon Black is widely used black pigment because of its colouring ability, cost effectiveness and performance. Its particle size ranges from 10 to 120 nm. Lower the particle size higher the surface area. Higher surface area increase both jetness and UV resistance because more surface area is available for absorption of visible and UV light. Carbon Black has tendency to form aggregates. Performance of a black masterbatch is mainly depends on the dispersion of carbon black in the carrier resin. M. G. Polyblends uses speciality additives and processing aids so that carbon black gets easily and uniformly dispersed in carrier resin and hence it gives black masterbatch with optimum performance in the final applications. M. G. Polyblends Colour masterbatches are available in over 2000 different shades to meet the requirements of different industries. We have a well equipped facility in our colour matching laboratory to develop colour as per customer requirment. We have in our records every little detail of the masterbatch composition and processing conditions and hence we are able to replicate the same masterbatch at anytime in furture without any deviation in colour shades or other properties. M. G. Polyblends colour masterbatches are manufactured with virgin raw materials and processed on the latest machinery giving high quality products. We use international quality pigments which have high thermal stability, colour consistency in every lot and excellent light fastness. M. G. Polyblends has Colour masterbatch suitable for following plastic industries such as Mono/Multi layer film, Woven Sacks, Injection moulding, Rotomoulding, Blow Moulding, HDPE Pipe, Wires and Cables etc. Metallic Masterbatches: These masterbatches add glittering/metallic effect in the final product. Metallic flakes/pigments are added to a traditional solid colouring system to create this effect. These are mainly used in cosmetic tube, injection moulded items etc. Pearlescent Masterbatches: These masterbatches contains special pearl pigments having varying particle sizes to give luster/sparkle effect. These can be produced in silver, gold or any other colour. These are mainly used in Injection moulded items, Cosmetic tubings etc. Fluorescent Masterbatches: These masterbatches contains fluorescent pigments which are not only possess the colour it reflects but also emits fluorescent light in same colour. The colour observed from a fluorescent masterbatch is a combination of reflected and emitted light, thus the colour appears extra bright. It is mainly used in toys, marker pen body and caps, safety signs etc. Phosphorescent/Glow In Dark Masterbatches: This is a specially formulated masterbatch containing polycrystalline inorganic metal sulfides along with some additives to make it suitable for easy incorporation in plastic articles. It does not contain any radioactive substance which are harmful to human. M.G. Polyblends has developed these masterbatches in three colours (Green, Blue and Orange) to enchance the aesthetic appeal of the final product along with its excellent glowing properties. It is mainly used in injection moulded items. e.g. Toys, glass side rings in Torches etc. Optical Brightner (OB) Masterbatches: These are based on bisbenzoxazole type organic derivative dispersed in polyolefinic polymer. It is added in polymer to reduce yellowing, improve whiteness, and to enhance the brightness of a product. It function by absorbing ultraviolet radiation and re-emitting blue light. M. G. Polyblends has also developed OB masterbatch which enhance whiteness and brightness of the product without giving bluer tone. UV Masterbatches: M. G. Polyblends UV masterbatch is based on hindered amine light stabilizer which is properly dispersed in a polyolefin carrier. It extends the service life of moulded and extruded product when exposed to sunlight. It provides weatherability characteristics to moulded items for outdoor applications, Automobile components, Irrigation pipes, Rotomoulded tanks, Garden chairs, Crates etc. Antiblock Masterbatch: It is based on combination of highly pure and ultrarefined silica and amide additives. It counter acts the tendency of extruded films to stick together and improves the opening characteristics of films/bags. It is mainly used in Mono/Multilayer blown film for flexible packaging. Antioxidant Masterbatches: Antioxidant masterbatches are used in polymers to avoid oxidative degradation at higher processing/application temperature and thus helps in retaining gloss, mechanical properties of the product which would otherwise deteriorate. M. G. Polyblends has designed this masterbatch based on stearically hindered phenolic antioxidant properly dispersed in polyolefin carrier. It is suitable for Blow moulded items, Rotomoulded tanks, Pipes and profiles, Films, Injection moulded parts etc. Silicone Masterbatch: It contains ultra high molecular weight polydimethylsiloxane additive dispersed in polythylene. It gives lubricity, reduces coefficient of friction and improves abrasion resistance. It is mainly used in HDPE optical fibre ducts. Slip Masterbatch: It is based on amide additive which migrates to the surface of the extruded/moulded plastic product and provide a monomolecular layer which reduces coefficient of friction (C.O.F.) between the layers of the film and other surfaces which are in contact with film. It ensures good handling properties in automotive packaging application and also does not effect sealing and printing properties. It is mainly used in Mono/Multilayer films etc. Polymer Processing Aid (Ppa) Masterbatches: It is a fluoropolymer based additive masterbatch properly dispersed in a polyolefin polymer. It improves the processing of polyolefins (LLDPE, HDPE etc) particularly in blown film extrusion alongwith other benefits such as removal of die lines, melt fracture, back pressure and increase in gloss and output. It is also used in blow moulded items to improve output and gloss on the surface. Rotofoam Masterbatch: M. G.Polyblends Rotofoam masterbatch contains blowing agent properly dispersed in a polyolefin resin alongwith some speciality chemicals which helps in creating a very fine cell structure in three layer Rotomoulded LLDPE tanks. This foam middle layer acts as a insulator and as a result water or any other liquid remains cool during winters and vice versa. The quest for total excellence drives the company's comprehensive quality assurance programme. From the raw material stage onwards, till the masterbatch is finally ready for delivery, a host of quality checks and tests are conducted in between. New generation systems are used to ensure that every analysis is reliable and accurate. For instance, the base resin's melt flow index is checked using the MFI tester. The muffle furnace is used to monitor not only the ash content of the masterbatch sample provided by the client., but also the Titanium Dioxide content specially in white masterbatches. Thermal stability of pigments is thoroughly checked, using the injection moulding machine before any pigment is incorporated in masterbatches. Likewise, the universal air oven is employed to analyse the moisture content of the resin/masterbatch. And the colour matching cabinet enables assessment of the product's true colour in various light conditions like D-65, UV, etc. This is particularly useful for products like fluorescent and phosphorescent masterbatches that have to deliver precise visual impact in the end-product. The world renowned GretagMacbeth Colour Spectrophotometer plays as vital role in M. G.'s quest for accurately developed masterbatches. It helps check the colour and shade, and the extent of pigment dispersion in the resin, with microprocessor precision. Processing temperatures at both the extruder and the die are maintained with exceptional accuracy, with fluctuations not exceeding +/- 1deg C. This is especially advantageous for masterbatches incorporating heat sensitive ingredients. Once a masterbatch is developed, and before it is released to the customer, it is subjected to multiple field trials. Two roll mills, compression moulding machine and a laboratory kneader-extruder-pelletizer line are some of the equipment used to match the masterbatch with the sample provided by the customer within no time at all. A laboratory model blown film extruder facilitates testing of the masterbatch under simulated operating conditions. Similarly, an injection moulding machine is used to generate test sample chips from a new masterbatch - to the same specifications that the client would employ in actual application. Such prototyping is the culmination of the complex and demanding process of developing a unique and perfect formulation. It is also the ultimate test of the quality and performance of the masterbatch - an index of whether it will actually deliver what it promises. At M. G., once a masterbatch is developed, it can be replicated or reproduced at any time thereafter. This is because every little detail of the masterbatch's composition and processing conditions - from kneading time to extrusion temperature - is fully recorded and documented. Also , master samples of both the masterbatch as well as blown film/moulded chip are retained for future reference. All this implies a long term assurance for the M. G. customer. Should he require a repeat consignment of a specific masterbatch even years later, he will receive a true and perfect replica of the original. Every Time.